Ever since the first DW-5000C, G-SHOCK has been constantly setting new standards in innovative design, tough structure, and powerful modules. Now to mark the 2018 35th Anniversary of the G-SHOCK come the GMW-B5000, a full-metal G-SHOCK with a Connected engine, and the GMW-B5000TFG. 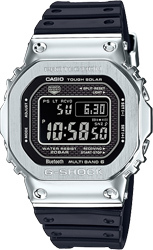 These models are full-metal versions the DW-5000 base model. The new GMW-B5000 Series represents a refinement of the hollow case structure to achieve an even higher level of shock resistance. Fine resin shock absorbers between the metal bezel and case created a shock resistant structure for a full-metal case. Innovative new band connections, which are components that are subjected to the strongest shock levels, add additional center lugs that lessen the load on the band pins. The soft resin band of the GMW-B5000 creates a more comfortable fit, and the screw back case, with a highly wear resistant diamond like coating (DLC), gives the watch a feeling of heft. 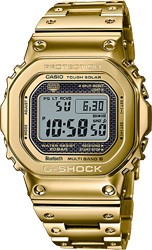 To mark G-SHOCK's 35th Anniversary, this collection also includes the GMW-B5000TFG, which is a limited-edition gold ion-plated model that dresses up the full metal 5000 specs in a gorgeous gold color. This, along with a 35th Anniversary logo impressed on the back cover and special packaging, makes this model a great way to mark this momentous occasion. Function-wise, these models are designed for outstanding timekeeping accuracy using Bluetooth® data communication and Multiband 6, which supports automatic time setting adjustment based on one of six time calibration signals around the globe. 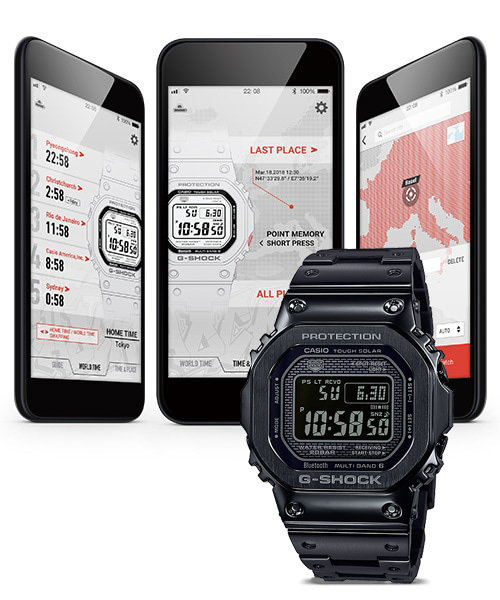 Time information can be acquired from an internet time server using the G-SHOCK Connected*1 app running on a smartphone. 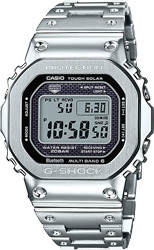 Maintaining the original G-SHOCK concept, the exterior designs, structures, and modules of these models have been further improved and then packed into a full-metal configuration. This and more makes the GMW-B5000D a new brand masterpiece that promises new potential in the G-SHOCK's 2018 35th year.